When the Original X-Men decided to remain in the future, despite Angel’s objections, the team began to fall apart. They were shocked when Angel left to join the Uncanny X-Men and Cyclops’ rival school. The young Jean Grey also struggled to cope with the discovery of her adult memories and the unpredictability of her powers. Elsewhere the shape-shifting Mutant known as Mystique has joined forces with Sabertooth and Lady Mastermind to carry out a series of robberies posing as the Original X-Men. 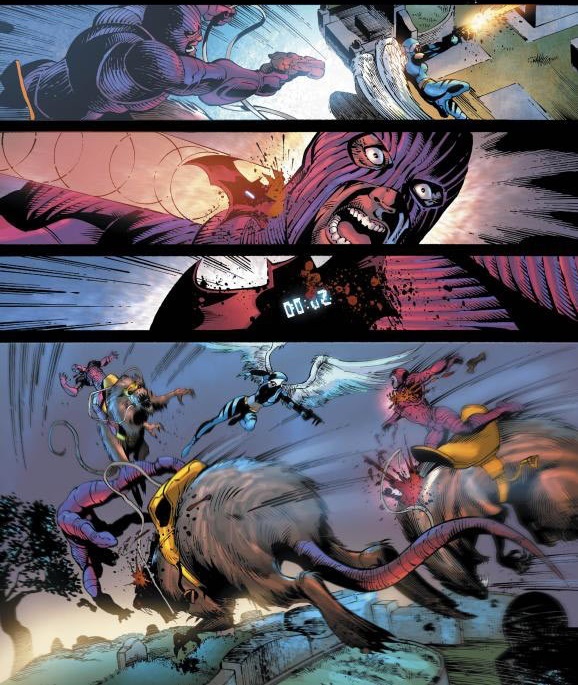 As the Original X-Men set out on their next mission with Wolverine and Kitty, their aircraft is forced to land by the Uncanny Avengers, who are led by Alex Summers, the brother that Cyclops thought he’d lost. 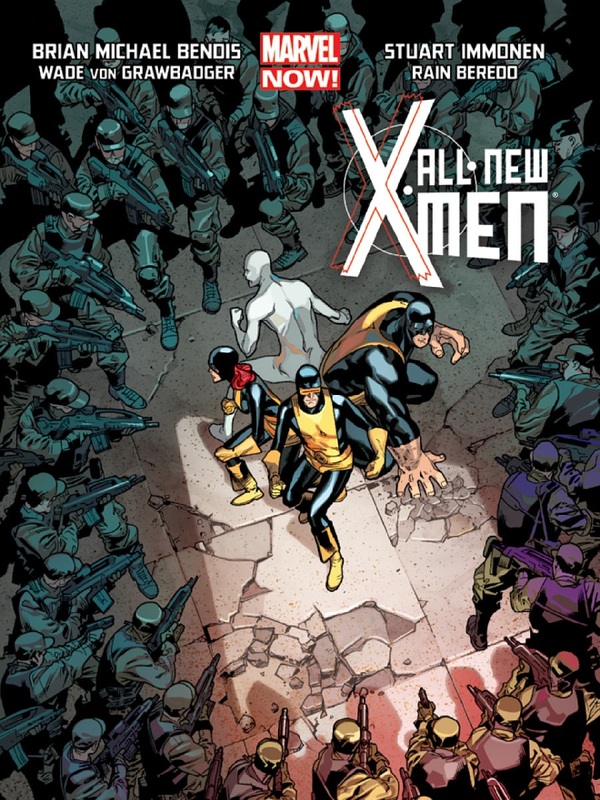 All New X-Men #12 sees the first encounter between the young Scott Summers and his brother Alex Summers. In another marvellously time warping twist by Brian Michael Bendis, this means that Alex is now paradoxically older than his older brother. 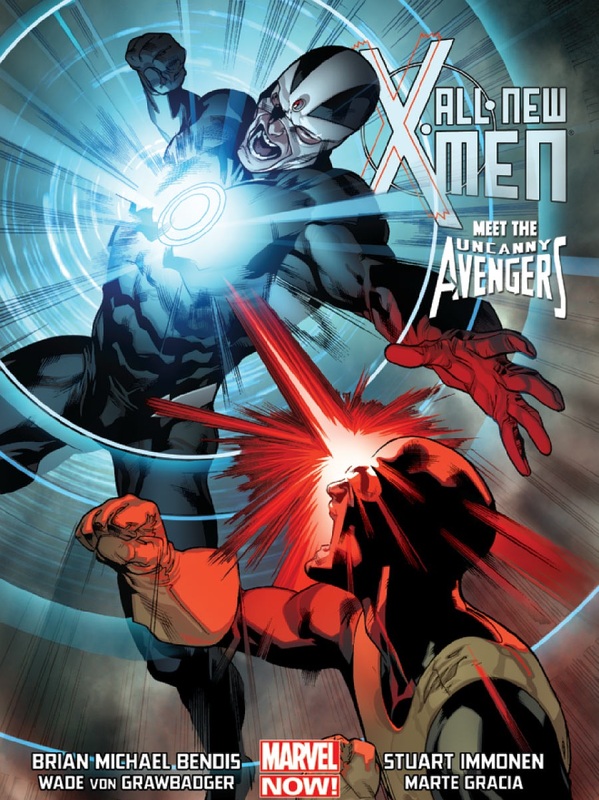 The cover of All New X-Men #12 may depict a battle between Cyclops and Havok; however what we actually get is the complete opposite, and its all the more rewarding for it. 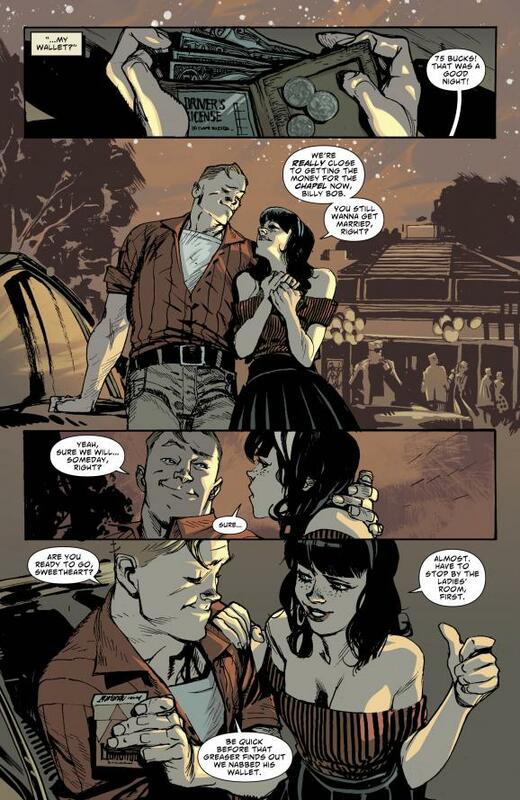 Brian Michael Bendis provides some of the best moments in the series so far, as Scott is reunited with Alex for the first time, at least from the younger Scott’s perspective. The dialogue in these scenes is fantastic, it’s great to see these two characters finally meet, and it gives them a chance to talk quietly and alone without interruption. However, it’s not long before Jean has a peek inside the mind of the Scarlet Witch and all hell breaks loose. 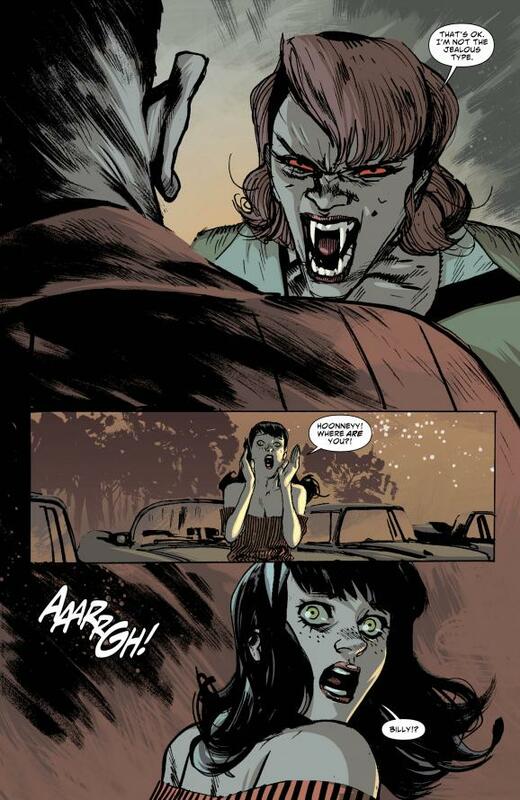 Horrified by the ramifications of Wanda’s actions during M Day, Jean unleashes the full fury of her powers at her. 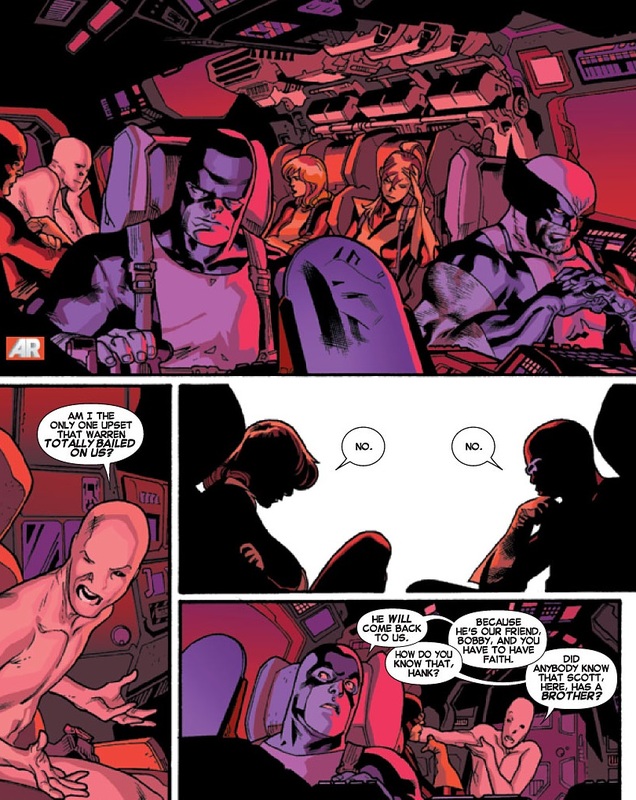 While the battle between Jean and the Scarlet Witch is spectacular, it’s all over very quickly, and when Captain America reveals that the Original X-Men are now wanted felons the full extent of what Mystique has done becomes clear to all concerned. 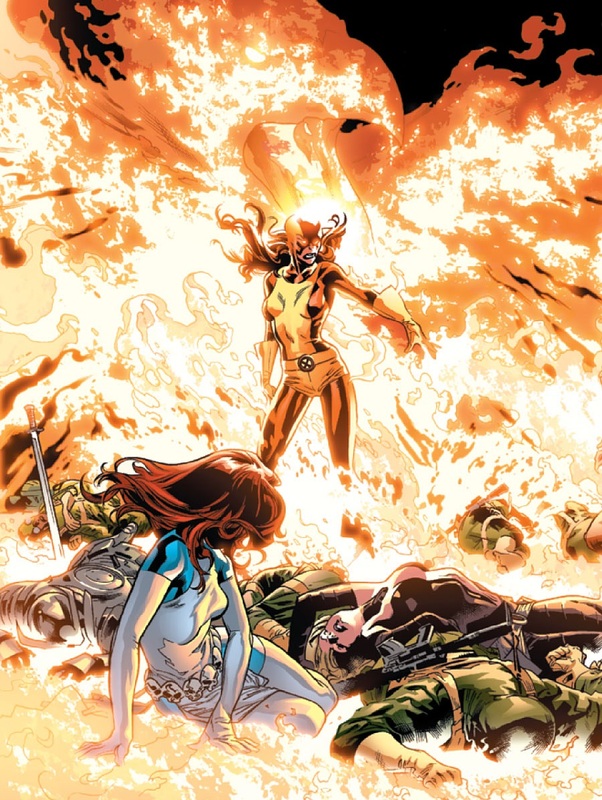 This issue of All New X-Men draws some striking parallels between Wanda’s role in M Day and how Cyclops acted after he became corrupted by the by the Phoenix Force in AvX. It brings everything – past and present – into sharp focus in the most dramatic way possible. The Original X-Men are quick to pick up on this, placing both teams on the spot as some particularly awkward questions are asked by the young X-Men. The art by Stuart Immonen is absolutely stunning. Every page is beautifully rendered; Scott’s reunion with Alex is the real highlight of this issue though, although the quick fight between Wanda and Jean is also excellent. We also get to catch up with Mystique, Sabertooth, and Lady Mastermind as they stage a robbery at the Bank of England. I particularly like the way Regan questions Mystique about her plans for all the money they’ve been stealing, the sharp witted dialogue by Bendis hit’s the nail right on the head, and the illusion Lady Mastermind uses to cover their escape is brilliantly captured in a full-page-splash by Immonen. All New X-Men #12 is another fantastic instalment, it’s full of brilliantly written character moments by Brian Michael Bendis, and Stuart Immonen and his art team continue to impress on all fronts. This is one of the best X-Men books around, and I highly recommend it. Rick takes a small group of his people to meet with Ezekiel at the Kingdom. Together with Carl, Michonne, Andrea, by his side, their first meeting gets off to a shaky start when Michonne clashes with Ezekiel. It is only later in private, after the preparations for their war against Negan and the Saviors are discussed, that Ezekiel drops his pretence and confides in Michonne about his past. Ezeikel was a zookeeper, he saved Shiva the tiger during the Zombie outbreak, and his persona as ruler of the Kingdom is just a role he has adopted. 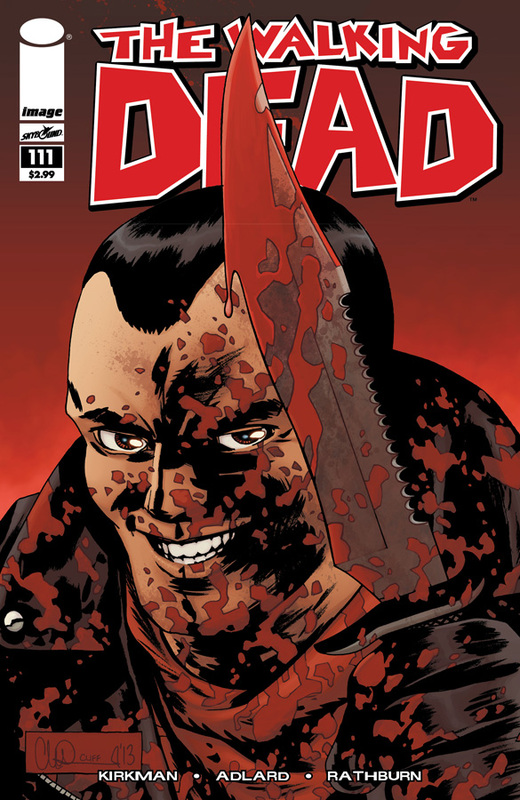 The Walking Dead #111 continues to build the suspense as Robert Kirkman steers the opposing factions ever closer to their impending showdown with Negan and the Saviors. It’s good to see all the major cast members playing a part in the training of the troops, and there are some great moments with Michonne as well. But things suddenly take a dark turn in The Walking Dead #111 as Negan arrives to collect his tribute while Rick is still busy at the Kingdom. Negan is quickly becoming one of Kirkman’s most sinister and deranged characters to date, he seems even more arrogant than usual this issue, and the way he talks to Olivia is particularly loathsome. His moods swing from crass comments and tantrums one moment to brutal violence the next, its chilling to behold, and it makes him dangerously unpredictable as his twisted sense of morality claims yet another victim. The art by Charlie Adlard is as exceptional as ever, with lots of cast members appearing, as Rick and Ezekiel make their battle plans. But it is in the closing moments were Adlard’s art really shines, where Negan lashes out, and the gore begins to splatter across the page. 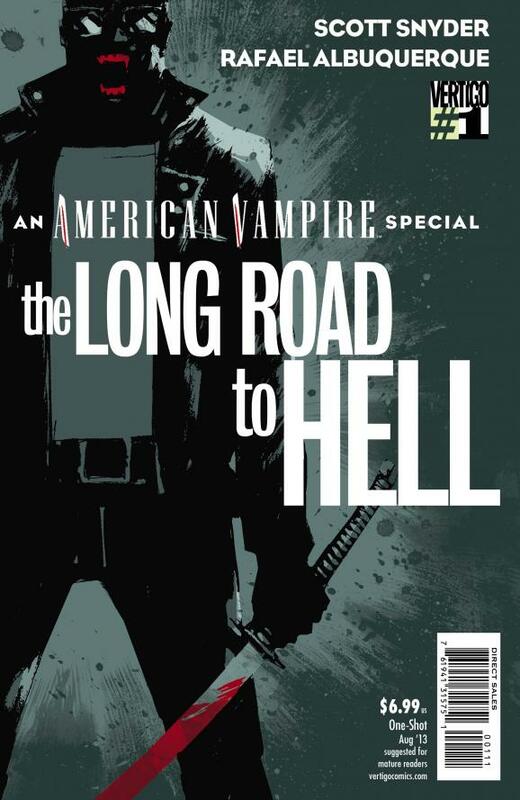 What initially seemed like another slow burning issue suddenly erupts with gut churning violence, the large splash panels capture every horrifying moment, and you will be left reeling by the callous gleam of pleasure that sparkles in Negan’s eyes. The Walking Dead #111 is another great issue that sees various storylines coming together, with some good character development thrown in for good measure, and it has a blood soaked ending that is guaranteed to shock. Over the last thirty five years since DC Comics flagship character was immortalised by Christopher Reeve in Richard Donner’s genre defining film, Superman The Movie (1978), Superman’s comic book adventures have continued to form some of DC Comics best-selling storylines, and his formative years were explored in the TV series Smallville, staring Tom Welling. Bryan Singer brought the character back to the big screen in Superman Returns (2006), in a film which remained faithful to the original film series, and ultimately failed to find its own identity in the process. Now the last son of Krypton is back in Zack Snyder’s eagerly awaited Man of Steel, with Henry Cavill as Superman, in the blockbusting movie event of the year. With the planet Krypton facing imminent destruction because of its unstable core, a rebel faction led by General Zod (Michael Shannon) and his sadistic second-in-command Faora_Ul (Antje Traue), attempt to wrest control from the ruling council. The scientist Jor-El (Russell Crowe) and his beloved wife Lara (Ayelet Zurer) implant the genetic Codex of Krypton into their newborn son, Kal-El, before sending him to Earth in a spacecraft in order to preserve the future of their race. After his plan fails Zod and his associates are captured and banished to the Phantom Zone, before Krypton is destroyed in a cataclysmic explosion. The craft carrying Kal-El crash lands in Kansas where he is discovered by Jonathan (Kevin Costner) and Martha Kent (Diane Lane), who then raise the child as their own on their farm. As the young Clark Kent (played by Cooper Timberline and Dylan Sprayberry) grows up in Smallville he struggles to control his powers, feeling increasingly like and outcast, until he finally leaves home in search of his destiny. Clark (now played by Henry Cavill) spends the next few years as a drifter, using his powers only in the most extreme of circumstances, but a chance encounter with intrepid Daily Plant reporter Lois Lane (Amy Adams) sets Clark on the path to discovering his Kryptonian birthright. Lois promises to keep Clark’s identity a secret, but after General Zod escapes from the Phantom Zone and his spaceship arrives in orbit, the world becomes aware of his presence when Zod hijacks the planets communication systems and issues an ultimatum to Kal-El, stating that he has twenty four hours to give himself up or the people of Earth will suffer the consequence. Superman has no choice but to surrender himself to the military, where he is interviewed by Lois, before Faora_Ul arrives to take him to General Zod. 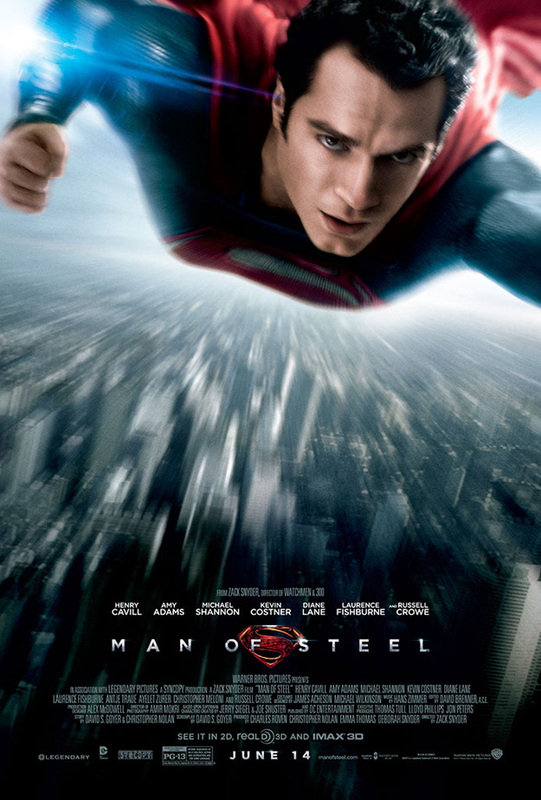 Zack Snyder wisely avoids the pitfalls of Bryan Singer’s uninspired misfire Superman Returns (2006) by adopting a completely fresh approach to the character, with Christopher Nolan on board as producer and storyline co-writer, Man of Steel is a reboot that grounds itself in a harder edged reality in much the same way Nolan’s award-winning Dark Knight trilogy. Snyder supplants the basic premise of Superman’s origin, depicting Kal-El more like an extraterrestrial messiah than the superhero he ultimately chooses to become. We follow Kal-El from the moment of his birth, where Krypton faces civil unrest as the planet teeters on the brink of certain destruction. This is a Krypton like no other we have seen before, a stunning mix of Star Wars and Avatar like visuals, blessed with incredible technology and beautiful winged beasts that swoop across gleaming oceans as a ravaged moon hangs in the perpetual twilight of this doomed world. In the aftermath of Krypton’s destruction the escape ship carrying baby Kal-El brings him to his adoptive world and into the lives of Jonathan and Martha Kent who raise him as their own son. Flash-Forward to the present day and we meet Henry Cavill as the troubled Clark Kent, a bearded loner who is struggling to find his place in the world. It is at this point that Zack Snyder skilfully begins to refer back to Clark’s childhood at key points throughout the film, were he was bullied and ridiculed as his powers began to manifest themselves, before following Clark into adulthood as the narrative of the present is punctuated by his relationship with his adoptive parents. Henry Cavill gives a great performance as the outsider from another world; he brings a darker edge to the character, together with an imposing physical presence that helps balance the benevolent side of Superman’s character with the furious rage he later unleashes against Zod. The introduction of Amy Adams as Lois Lane coincides with the moment that leads to Clark discovering his true identity, and he forges a close relationship with the Daily Planet reporter. Like any good reporter worth her salt, Lois Lane is right at the heart of the action, and doesn’t let a dressing down by her editor-in-chief Perry White (Laurence Fishburne) or the impending threat of Zod’s invasion put her off. Amy Adam’s is entirely convincing as Lois Lane, her steely resolve stands her in good stead, and her dedication to keeping Clark’s secret is cauterised by a selfless act of trust. Although they can’t match Christopher Reeve and Margot Kidder’s fabulous onscreen chemistry, Cavill and Adam’s are both superbly cast as Lois and Clark, brining a sense of believability to their blossoming romance, and there is certainly plenty of potential here to explore in the future. Man of Steel is full of standout performances that really help enhance Snyder’s new take on the mythology of the man of tomorrow, with Russell Crowe giving a stellar performance as Kal-El’s biological father, while Kevin Costner’s Jonathan Kent provides the moral compass that steers Clark along the rocky path to adulthood and the hero he ultimately becomes. Diane Lane is also exceptionally good as Martha Kent; her scenes with Henry Cavill are particularly moving, especially when Clark returns home after discovering who he really is. 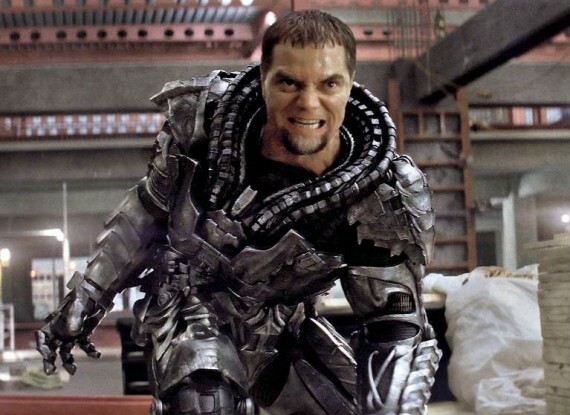 Michael Shannon makes General Zod a force to be reckoned with in Man of Steel, leading a coup against his own people, his return from the Phantom Zone after Krypton’s demise hones the tragedy to a razors edge for Zod. He travels to Earth having scoured the galaxy for the remnants of his people’s technology, finally tracking Kal-El to Earth, where he intends to rebuild his race. Shannon exudes intense evil as Zod, it would seem the misguided General has been driven almost to the brink of madness by loss of his home world, and he will let nothing stand in the way of achieving his goal. He tempers his performance with the same icy menace Terrance Stamp established with Zod in Superman II (1980); to make his armour clad Zod a fearsome engine of destruction. Zod even uses a metaphorical form of Kryptonite against Superman, when the atmosphere on his spaceship drains Kal-El’s powers to make him vulnerable, as the full horror of Zod’s apocalyptic vision becomes apparent. Zod’s most trusted warrior Faora-Ul is played by Antje Traue, her character seems to delight in her newfound powers, perhaps even more so than Zod. Her strength and skills are used to devastating effect, Traue is brilliant as the Kryptonian warrior, she gets to fight Superman and also ruthlessly cuts a swathe through the military forces sent against her. Zack Snyder has brought us some of the most visually striking films in recent years, with Sucker Punch, 300, and Watchmen all delivering their fair quota of big action set-pieces – although sometimes at the expense of style over substance. 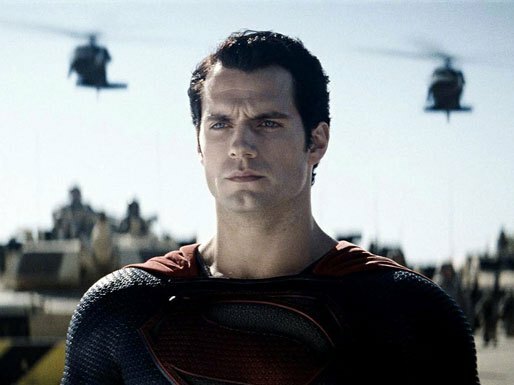 What sets Man of Steel apart is the way Christopher Nolan’s influence has given the film a much wider scope, allowing the characters a chance to grow and develop, striking just the right balance between Zack Snyder’s earth shattering action sequences and the more emotively charged scenes. There are even a couple of well placed “Easter eggs” that hints towards other characters in the DC universe. However, the story does get a little bogged down at times, especially as Clark has to decide if he should surrender to Zod, and the religious imagery that accompanies much of this clunky exposition is less than subtle. We also get a much deeper insight into how Clark’s powers work. The novelty of X-Ray vision and Super-Hearing are quickly dispelled, becoming a horrific assault on the senses, and it is this terrifying experience from his childhood that he uses against Zod during the initial stages of their conflict. The power of flight is also brilliantly portrayed, especially when Superman takes to the sky for the first time, you really get a sense of the raw power and effort it appears to take as Kal-El joyfully soars through the clouds at incredible speed. The special effects for this $225 million dollar reboot are truly spectacular: Krypton’s death throes are an awesome spectacle to behold, a burning oil rig collapses into the sea, and a young Clark saves his schoolmates when their bus sinks into a river – and that’s just for starters. By the time Clark has discovered his Kryptonian identity, Zod arrives on Earth, soon the World Engine is threatening to tear the Earth apart, leading to a breathtaking finale where Superman battles Zod in Metropolis – where Snyder gives Michael Bay a run for his money in terms of wanton destruction and slavish pyrotechnic chaos. Here we get to see the full extent of their powers, every punch sends the other flying across the screen, buildings topple all around them, and when the dust settles the price of victory is high indeed. Though its ending may prove to be too much of a step away from what defines the character for some, it still cannot diminish the added depth that Zack Snyder has managed to bring to the mythos of the last son of Krypton with Man of Steel. The films final act remains a breathtaking spectacle, this is the first time we have ever really seen Superman unleash his powers so ferociously on screen, and its made all the more exciting by the groundwork set down earlier in the film that paves the way to this monumental clash of the Kryptonian titans. Man of Steel may not be the perfect film we were hoping for, but it’s definitely a confident step in the right direction. Origins are something of a holy grail when it comes to comic books. They define what we know about a character, often forming the backbone for a continuity that can endure across countless decades, and only the most brave and the bold possess the skill to tamper with such a legacy – let alone even attempt to retell such a momentous event. 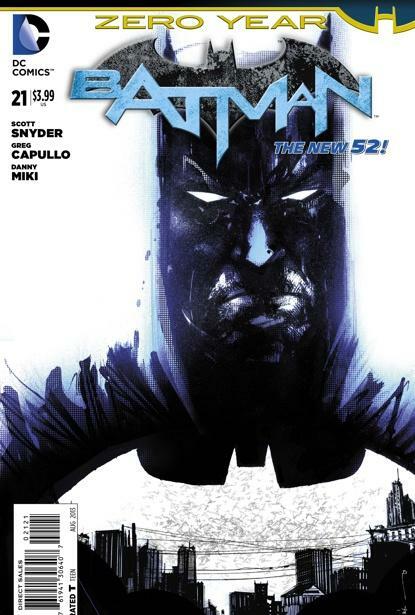 Batman #21 marks the beginning of one of the biggest comic book storylines of 2013: Zero Year, the epic eleven part recasting of Batman’s origin by Scott Snyder and Greg Capullo. The legendary origin of Batman begins anew with Zero Year: Batman #21 six years ago when Gotham City was ruled by The Red Hood Gang, a sophisticated group of anonymous Gothamites – the Red Hood’s – who are always ready respond to the call of their mysterious leader. The young Bruce Wayne has chosen this moment to return to Gotham, having been declared legally dead in his long absence, he arrives to reclaim the city from this new criminal mastermind. With Alfred’s help Bruce begins to form a profile on the Red Hood, collating the data as he continues training. Bruce’s uncle – Philip Kane – now acts as his advisor at Wayne Industries, but are his plans really in the best interest of the heir to the Wayne Empire? It falls to Bruce to tackle the menace of the Red Hood’s, but he must do so alone, and without the cape and cowl of the Dark Knight. The Red Hood and his gang featured prominently in last years Batman #0 issue, where Bruce Wayne attempted to infiltrate the gang in an undercover operation, but unfortunately Bruce underestimated his adversary and the Red Hood quickly saw through his disguise. The Red Hood gang look set to play a big role in Zero Year, as we learn more about these individuals who wear opaque red masks to hide their identities, and discover more about their leader – the Red Hood. When he was introduced in 1951 in Detective Comics #168 the Red Hood eventually turned out to be the Joker; revealing the story of his transformation into the Clown Prince of Crime. 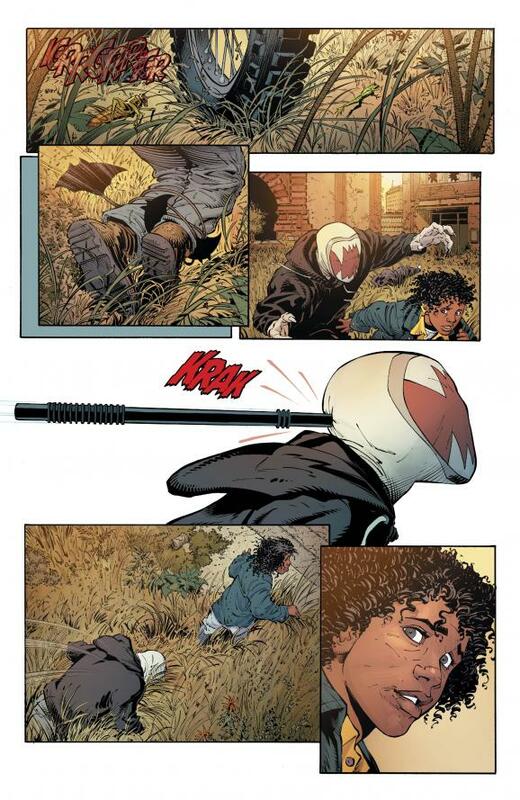 As ever Scott Snyder brings a fresh perspective to the character, updating the original storyline while preserving the mystery of his identity, perhaps indicating that he may not turn out to be quite who we are expecting. Batman #21 opens with an intriguing glimpse of things to come before we rejoin Bruce as he faces his next encounter with the Red Hood gang. The tense standoff sees Bruce rescuing the gang’s hostages, but he is unable to capture the Red Hood, and his identity remains a mystery. Bruce returns to his base of operations to discuss the situation with Alfred, it seems that each gang member is blackmailed into working for the Red Hood. Bruce has yet to announce his return to Gotham, but when his uncle, Philip Kane, turns up on his doorstep, Bruce goes with him to see the new Wayne Enterprises building. 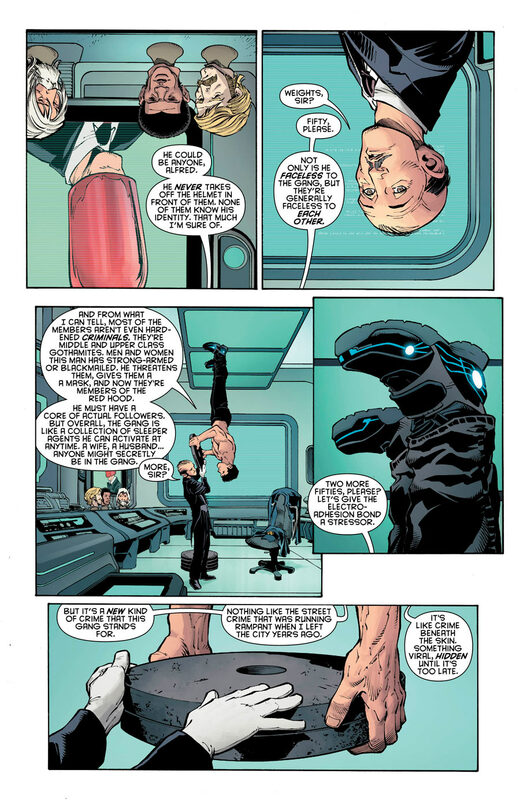 With his life spinning like a penny before him, Bruce listens as Kane explains his vision for the company, but Bruce has returned for reasons of his own. Secret City: Part One not only sets up another exciting encounter with the Red Hood gang, it also sees Bruce Wayne take his first step into announcing his return to Gotham City. There are some wonderful scenes between Bruce and Alfred in Batman #21, whether they are gathering data on the Red Hood gang or addressing the “mission” that Bruce is dedicating his life to, Snyder’s brilliant dialogue makes these small moments shine. Greg Capullo’s art transports us back in time, showing us just how different Gotham City was during this dark period. You almost feel like you are returning to Gotham yourself, seeing everything through Bruce’s eyes, as the past converges with the present to foreshadow the legacy of the bat in the very buildings themselves. Batman #21 is full of potent symbols which only scratch the surface of what we can expect from Zero Year, interspaced with scenes from Bruce’s childhood, and a surprise ending that few of us could have expected. Snyder and Capullo have masterfully managed to encapsulate the essence of what made Year One by Frank Miller and David Mazzucchelli so riveting, but Zero Year also has a deep respect for this unrivalled masterpiece. It is clear from this first instalment in Batman #21 that Zero Year has the same gritty realism and bearing on the character as Year One. This is no attempt to overshadow what has gone before, instead it aims to complement the past by revisiting the story in a brand new way, making Batman and Gotham real and current to readers today. 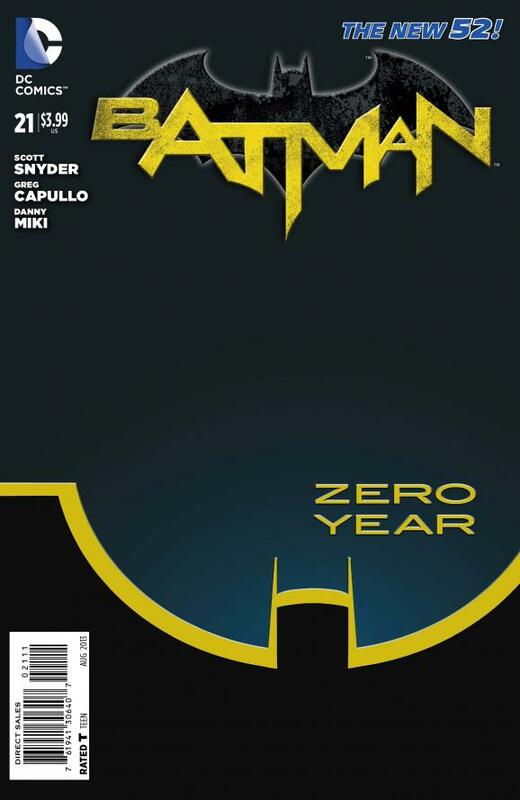 In taking this approach Snyder and Capullo ensure that Zero Year has a very distinct identity of its own, brining it right back to the beginning when that tragic night in the alley created an orphan who would rise on the dark wings of fate, shaping his life – his city – in a way that few of us could ever have imagined possible. The backup stories for Zero Year by Scott Snyder, James Tynion IV, and Rafael Albuquerque, detail the trials that Bruce Wayne faced as he set out on his quest to hone his skills in preparation for his crime fighting career. In this first glimpse into Bruce Wayne’s youth – Where the Hell Did He Learn to Drive? – we meet the nineteen year old Bruce in Rio De Janeiro, where he is learning the finer points of getaway driving from Don Miguel as they try to outrace the authorities. This exciting glimpse into Bruce‘s formative years sees him at the wheel of a luxury sports car, while Don Miguel prepares to use their stolen weapons against the Police. It an interesting concept, to see Bruce learning from criminals, and then using the skill he gains against them. This story also features some terrific art by Rafael Albuquerque, who captures every moment of the high-octane car chase, which culminates with a fitting end for the cop-killing car thief. Batman #21 is the beginning of an epic. Zero Year may prove divisive for some, inevitably it will be judged by what has gone before, but as this issue clearly demonstrates Zero Year is no simple retread of the past just to shoehorn Batman’s origin into the framework of The New 52. Scott Snyder and Greg Capullo have poured their heart and soul into this project, every page of Batman #21 stands as a testament to their utmost dedication to the character, and I have every faith that Zero Year will live up to everything they have promised it to be. As the World Army prepares to go to war with Steppenwolf in Dherain, we rejoin Commander Khan on the Sentinel as he confers with his superiors and explains his reasons for sending Captain Steel to investigate the strange reports coming from the fire pit in Rio De Janeiro. The fire pits were created by Terry Sloan during the war, using Apokolips science from Steppenwolf‘s base, and they have continued to burn around the world ever since. While the pit in Rio is fiery and hot, it is no longer radioactive. After years of being dormant the pit has suddenly become active, in the last week people have gone missing, and a figure has been seen in the flames. Khan is confident that the unique properties of Captain Steel’s metal body will allow him to enter the fire pit safely and ascertain the cause of the strange activity. When Captain Steel arrives in Rio he is greeted by the inventor Jim Lockhart, who is responsible for developing vehicles for the World Army to use in special missions. Lockhart has now completed the Red Torpedo, a small craft with a tough outer shell that Captain Steel will use to travel into the fiery core of the pit. The people of Rio watch and wait as Captain Steel boards the Red Torpedo and descends into the fire pit. 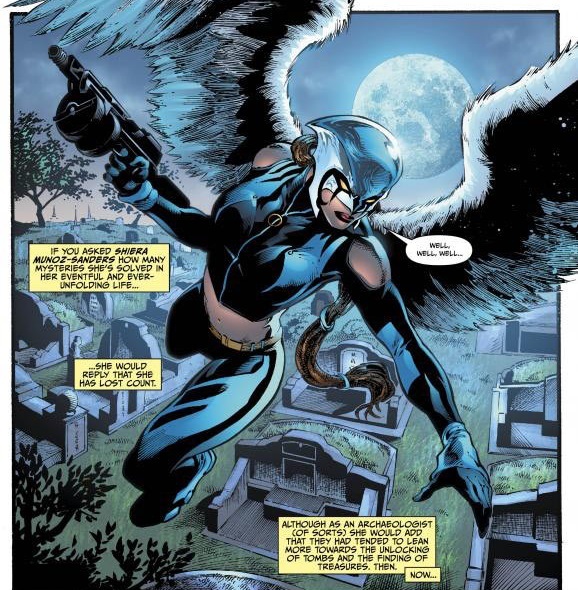 Meanwhile in China, where Hawkgirl is trying to find out why Green Lanterns partner Sam was murdered, she is attacked in the graveyard where Sam is buried by a group of assassins riding genetically enhanced Apokorats. She manages to fend off some of her attacker, blasting them from their mounts, when the new Batman arrives to dispatch another rider with an explosive Batarang. The mysterious Batman informs Hawkgirl that Kanto the Assassin of Apokolips is involved, instructing her to follow the trail to Kanto, before vanishing in a cloud of red smoke. Hawkgirl is left stunned by this new Batman’s sudden appearance; neither can she begin to understand how Sam became involved with Apokolips Battle Tech, or why he was killed for it. Back in Rio the fire pit is raging as something begins to emerge. Commander Khan desperately asks Lockhart to report what is happening, they are expecting the torpedo to return, but Lockhart can only watch in horror as a burning figure emerges from the flames and shambles towards him. The new subplot introduced in last weeks annual, about the investigation into the fire pits Sloan created during the Apokolips War, quickly becomes the focal point in Earth 2 #13 as we finally get a chance to see Captain Steel in action. Earth 2 #13 is another fine example of how richly detailed James Robinson’s alternative world has become, as he skilfully integrates Captain Steels origin into the plot, while revealing several key aspects about the World Army and their operations. We learn how American citizen Hank Heywood JR, a native Filipino, was born with a congenital defect that made his bones crumble. His father was a scientist, who used his genius to create a form of metal which he then infused with his sons DNA, before injecting it into Hank’s body. The metal bonded with Hank JR’s skeleton, before replacing his limbs, and even some of his internal organs. The procedure saved his life, giving him super strength and the ability to control any machinery by will power alone. Heywood then contacted the World Army about his discovery, intending to help them create an army of Captain Steels. The Apokolips forces discovered Heywood’s plan and attacked before he could reveal his secrets. His son fought valiantly against the Parademon horde, but he couldn’t stop them all. His father killed himself to prevent Steppenwolf from obtaining his research data, sacrificing himself to keep his secrets safe, and afterwards Hank JR went on to join the World Army – becoming its first new wonder. For fans of the golden age character Commander Steel, or the more recent Citizen Steel, it would seem that James Robinson has worked his magic again to update the character and his origin for a new generation of readers to enjoy. Captain Steel also takes a steely approach to his duty as a member of the World Army, he is very abrupt and just wants to get the job done, and seems to have little time or inclination to discuss his mission with Lockhart. The introduction to Captain Steel has been perfectly handled by James Robinson, the inclusion of Jim Lockhart is also an added bonus, striking just the right balance between the past and updating it for the New 52 version of Earth 2. We also learn details of the Red Files, secret projects initiated by the World Army after the Apokolips War to form contingency plans and deterrents against any future threats. These projects all contain the word red in their code names: the Red Tornado was one of the first, then there is the Red Arrow who has apparently been working secretly in the field for years, and the inventor Jim Lockhart is the man who built Red Torpedo. 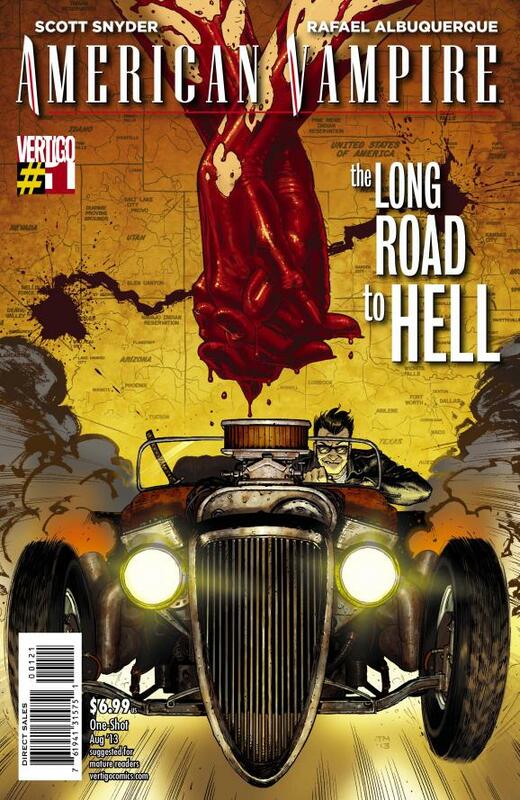 The new Batman also returns in Earth 2 #13 after making his debut in last weeks annual. He arrives to help Hawkgirl when she is attacked in the graveyard. 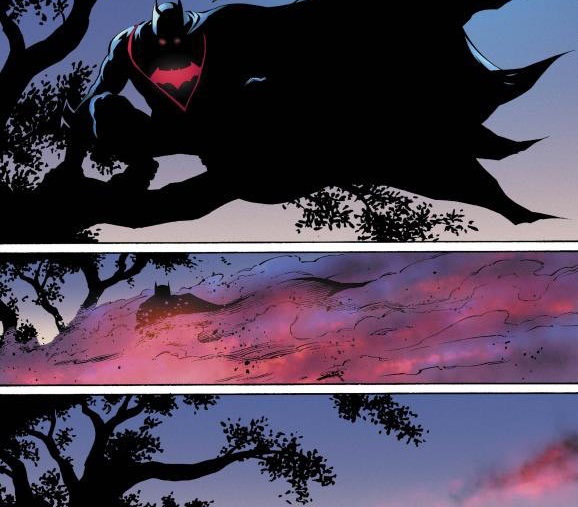 Although I think she would have been more than capable of handling the Apokorats herself, it sets up a nice scene between her and Batman, who then suddenly disappears in a cloud of red mist. One aspect here that I do find a little irritating is the fact that Hawkgirl’s name has suddenly been changed from Kendra to Shiera. No reason given to explain this change, hopefully it’s just a mistake, but it is a little worrying and highly inconsistent with what we have come to expect from this series. With the news that James Robinson has decided to leave DC and move on from Earth 2 after issue #16, there has been intense speculation about his reasons for leaving. He will be greatly missed by fans of the series, the dedication and attention to detail that Robinson has invested in establishing the characters of Earth 2 has been remarkable, and whoever takes over from him will have a lot to live up to. I just hope that Hawkgirl’s name change isn’t a sign that things are already starting to unravel, as it would be a great shame to see the essence of what has made Earth 2 so enjoyable become diluted by a series of bland concepts and uninspired storylines. The art for this issue of Earth 2 is handled by Yildiray Cinar, his brilliant pencils are nicely complemented by Rob Hunter’s inks, and together with color by Pete Pantazis and some great lettering by Dezi Sienty this issue really seems to jump off the page. 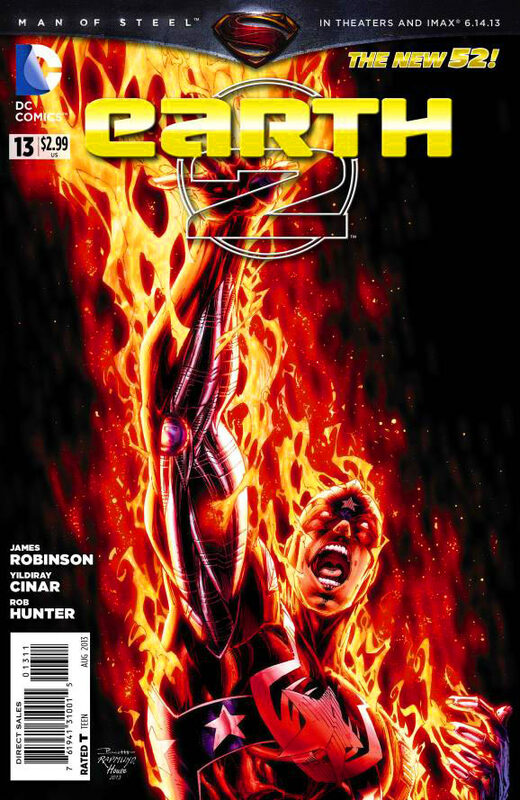 Earth 2 #13’s dramatic cover, with Captain Steel swathed in flames, is provided by Booth Rapmund. Its a really eye catching cover, with Captain Steel battling his way through fire, and gives a sense of just how powerful this character is. As this issue races towards its shocking conclusion, a new threat is discovered within the crimson flames of the fire pit, one so powerful that it could destroy the entire planet. Although I was a little disappointed that the cliff-hanger from last weeks annual wasn’t resolved, I do like how Robinson is maintaining the mystery surrounding the new Batman, who indecently has no trouble disappearing back into the shadows. Earth 2 #13 is a densely plotted issue, full of great character moments, and Robinson keeps you on the edge of your seat right up until the final page. Happy 1st Birthday Sci-Fi Jubilee! Yes that’s right; Sci-Fi Jubilee is one year old today! I’ve had great fun writing this blog over the last year, reading all your comments, and chatting to you all on twitter. When I started Sci-Fi Jubilee I began by doing a few Comic Book reviews, then I started covering Doctor Who, The Walking Dead, and more recently I’ve started reviewing films as well. The newest section of Sci-Fi Jubilee covers the Classic Series of Doctor Who, I’ve enjoyed reviewing the old episodes, and I hope to add more to this category in the future. 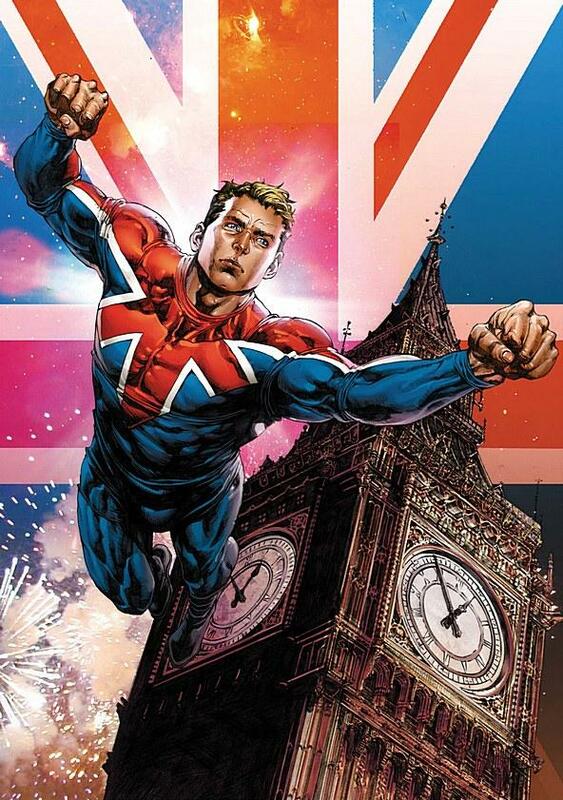 Sci-Fi Jubilee has been an incredibly fun and rewarding experience for me, but the thing I have enjoyed most of all is reading your comments and chatting to you all on Twitter about all the new Films, TV shows, and Comic Books that we all like so much. I have gotten to know a lot of you very well, and have enjoyed reading all your blogs and articles as well. So I would like to take this opportunity to say a big thank you to each and every one of you, thank you so much, because your support and comments have made Sci-Fi Jubilee what it is today. You are the ones who make writing Sci-Fi Jubilee such an absolute pleasure! Cheers everyone and here’s to another great year!